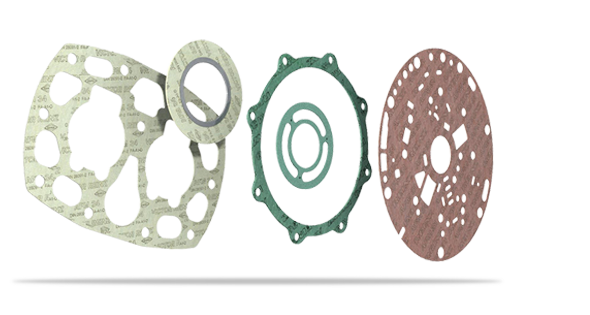 Helping to reduce engine downtime, our durable stamped gaskets are available in three custom designs for light-vehicle applications. All models are engineered with advanced materials and manufactured with efficient production procedures to keep costs low and value high. Stamped gaskets are put through rigorous testing and analysis methods to ensure that components perform in the most demanding environments. Dana’s soft, asbestos-free materials (AFM) for stamped gaskets are an important sealing solution for light-vehicle applications. The advanced technology of our AFM Series utilizes Aramid fibers, inorganic fillers, and a synthetic binder. Together, they provide better protection in a variety of important sealing applications. An anti-stick coating on both sides of the component prevents adhesion and facilitates ease of removal. MatriCS is a new generation of stamped, rubber-coated metal gaskets with a carbon-steel core and dual-coated, fiber-reinforced, temperature-resistant elastomer. While the primer layer acts as a tight bond, the anti-stick surface also allows optimal disassembly properties. Full and half embossments are available in an array of shapes to specifically cater to the application. MatriCS Plus gaskets feature the same long-term durability as MatriCS gaskets, but with a stainless steel core to further resist corrosion and wear. Enabling greater fuel economy, thicknesses range from .45 to .50 mm (0.018 to 0.020 inches), depending on desired compression. Utilizing Finite Element Analysis (FEA) allows our engineers to understand how hardware configurations affect gasket requirements. This is why we have developed various stamped gaskets to specifically cater to the range of requirements demanded by our customers including, AFM, MatriCS, and rubber-coated steel gaskets.